Yesterday roughly 150 people showed up at the California State building on Front Street to demand rejection of Gov. Schwartzenegger’s draconian cuts to state services. Rally attendees heard speakers from religious, trade-union, and community groups speak out against the cuts. With nearly one million children threatened with loss of their healthcare, one half million CALWORKS recipients losing support, and tens of thousands of elderly, disabled, and HIV positive patients losing access to services, the tone of the rally was angry. Speaker after speaker slammed the governor and called on the legislature to restore funding for the threatened services. Alternative ways of reducing the budget deficit suggested by speakers included rescinding tax breaks recently enacted for corporations, charging oil companies for the crude they extract (like most other states), and increasing the “sin” taxes on cigarettes and alcohol. The fact that the San Diego Union chose not to run a single story about this event is not surprising. The Union has supported the Governor’s cuts, and has hammered the Democratic dominated legislature’s attempts to mitigate the damage. The Union ‘s version of tough love seems to be that the poor, the young, the ill, and the disabled should suffer in order to preserve tax cuts for corporations, the oil industry, and the wealthy. What is more surprising is the lack luster response of the progressive community to this issue. One hundred and fifty protestors is an insufficient number given the damage these cuts will inflict. Where is our sense of priorities when thousands will demonstrate for gay marriage, but less than two hundred will show up to keep gay HIV patients alive? 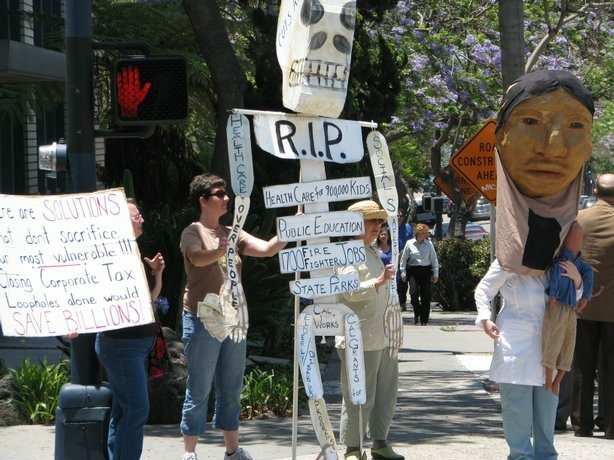 Where is our sense of morality when hundreds of thousands of San Diegans voted for a minority president, but a thousandth of that number protested the suffering and death that healthcare cuts will inflict on poor and minority children. Our anger is boundless when it comes to confining prisoners to jail cells in Guantanamo , but our anger is limited when disabled members of our community become prisoners in their own homes because the state will not longer pay for their helpers. This is also not an issue distant from Ocean Beach . Our little community is one of the poorest ocean side areas in southern California . We have a larger percent of OB elementary children (at nearly two thirds) declared economically disadvantaged than even Imperial Beach (at only 55%) in the 2007-08 school year. These are OB children who will show up to school next year sick and disabled if they are lucky enough to have a teacher to teach them as a result of these cuts. Unfortunately, we will have ample opportunity to work up our outrage in the next few weeks. With the Governor set to veto even the mild tax increases proposed by the Democrats in the legislature, we will see if our morality is equal to the task of stopping this slow motion train wreck. Hopefully our anger next time will be more proportionate to the damage being done to the most vulnerable in our community. Thanks for reporting on this, as it is becoming more apparent to people who receive these services that the cuts probably will happen – and it is causing a collective panic, at least from what I can tell. I do think the turnout was low if there were only about 150 people, however it was on a weekday…. I’ll echo Lane’s thanks for bringing this issue to the forefront, Gregg. And I agree that the turnout for rallies on some of the important issues that affect us all does seem pathetically low compared to those concerning some things that affect our morality but not necessarily our standard of living – contrasting this and general community interest in things like the public transportation budgetary shortfalls to things like outrage over Guantanamo or the latest incindiary comments by some whack job on the right really brings our priorities into focus. But, like Lane, I’ve got to say that most of us are stuck at work on the weekdays and, given the current state of the unemployment rate, thankful that we’ve got jobs to be stuck at. Tax my booze and my smokes more, I’ve got no beef with that. I should cut back on both or be forced to carry the heavier burden people like me put on the health care system anyway. And have I not been paying close enough attention or have we not been hearing enough about the recent rumblings over suggestions to seriously discuss legalization of cannabis for general consumption and the potential to raise tax revenues off the strongest agricultural industry in the state? What have we got, about a week and a half until crunch time now? I find it hard to believe there isn’t any way to live more within our means, especially in a recession? The private sector and tax payers are certainly making such adjustments and yet also just faced the largest hike in sales, auto and income tax surcharge ever in the US. The state gets a winfall bonus in the good times from property taxes on home sales or dot com booms, but we budget this into permanent increases. That’d be like me counting on getting a bonus every year and adjusting my spending accordingly. Every summer we play this silly game making loud noises about cuts to planned increases and the result is $40Billion increase in spending over the last 5-6 years, bonds to kick the can down the road further, or now an insatiable appetite to hike tax revenue. You can’t tell me there isn’t any waste or corruption with the government and unions at the top that would prevent making any cuts. Google the youtube “Heads on a Stick” protests in Fullerton and Corona in March and May and you’ll see crowds of 10,000 to 15,000 people who are paying attention to this issue and are concerned… but that didn’t get LA times press coverage either.